I must learn to live with ambiguity. Living with ambiguity is the mantra to my daily life. I was 20 years old when I first saw a card tacked up on a wall in a Heidelberg pension that read, “I must learn to live with ambiguity”. My memory tells me that my roommate, Alexa, put it there after reading it in Thornton Wilder’s, “The Skin of our Teeth”. I remember it resonated with me then — making me think of my own life not making much sense to me most of the time, and how I liked to just keep moving while hopefully having fun, and making friends while learning something. Years later, as a therapist fearful for a potentially suicidal client after she left my office, I used the sentence to reason with myself: I had to manage my fear and learn to live with the ambiguity that I didn’t have control over her actions; I would do the best I could to help her. 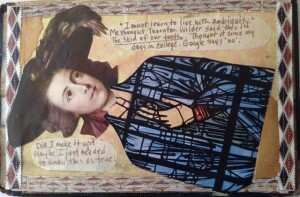 While making this mail art card, the image reminded me of the quote. Curious, I looked it up on the internet and a search told me that my memory was wrong. After all these years, I discovered it was not from the Thornton Wilder play. I looked back at the image and thought to myself that it doesn’t matter much where the quote is from, but it’s been important hold onto the sentiment, because well — I must learn to live with ambiguity. The image is a fancy dandy head and the body of a saint in a stained glass window. Two things that don’t fit together easily. I feel that way a lot. « Stop. Breathe. Look. Listen.